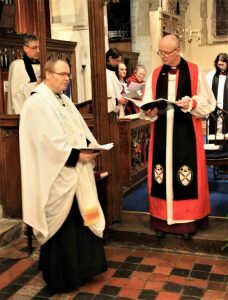 On the evening of Thursday 5th January, this year; we saw our beautiful and ancient parish church full to the rafters for the institution service of our new Vicar, the Rev. Ted Hurst. The service was led by the Right Reverend James Langstaff, Bishop of Rochester and the Venerable Simon Burton-Jones, Archdeacon of Rochester; supported by Rev. Sue Brewer, Area Dean, Gravesend. So many people came to support Ted; coming from, his previous parishes of Gillingham and Rainham, Ted’s own family and close friends, local Clergy and Lay Readers from the Gravesend Deanery, Clergy who have helped us during our year without a vicar, Greta Goatley the Mayor of Gravesham and Parish Council representatives, Caroline Conroy the head teacher of our Church of England Primary School and so many of our own parish family. The service was formal but light and everyone taking part enjoyed a wonderfully moving experience. We must thank those who spent many hours preparing for the evening; especially: Jane Watson, choir leader and the choir; along with the choir members from Ted’s previous parishes, who came to support our choir; Andrew Dunne, organist, who although not our own organist, spent his own free time to help us with preparing our music; Hilary Moore and her team of flower arrangers, for decorating the church so beautifully; Andrew Moffat, our retired churchwarden, for his tireless help with the invitations and expertise on planning the event; and a very big thank you to the family who made an anonymous donation, to cover the cost of the reception in the Village Hall; and of course thank you to Gloria Ashby, Ashby Caterers, for the lovely spread. We warmly thank everyone who took part or attended the event for their support and wish Ted and his wife, Silvie happiness in their new home and a long and fruitful ministry here in Shorne – please keep them in your prayers in the coming months as they begin their new lives amongst us.